GLENS FALLS – There’s no way to replicate playing before more than 5,000 fans in a game. There’s definitely no way to replicate playing in an arena with that many fans rooting for you to lose. 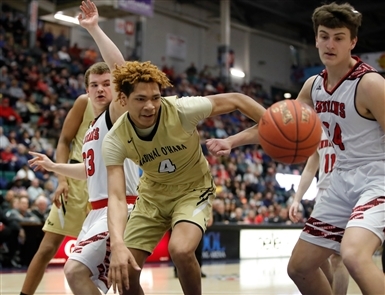 Still, with 2 minutes left, Cardinal O’Hara nearly had climbed out of a ditch that certainly seemed inescapable 12 minutes earlier, and the overall New York State Federation Class B championship that had seemingly slipped away was there for the taking. That’s when Glens Falls seized its shining moment for good and grounded the Hawks’ dream season. Diminutive guard Trent Girard drained a 3-pointer to blunt O’Hara's comeback attempt once and for all, as the host Indians captured the Federation championship by taking an 88-79 decision at Cool Insuring Arena on Sunday. Hometown hero, tournament MVP and New York Mr. Basketball Joe Girard III poured in a game-high 43 points in his scholastic finale with future college coach Jim Boeheim of Syracuse watching from press row. Girard's cousin, Trent, added 21 points on 5 of 6 shooting from beyond the arc as they took turns hitting shots that stalled O’Hara's comeback hopes. But none was bigger than Trent’s with 1 minute, 46 seconds left. The Hawks had trimmed an 18-point early third-quarter deficit to 77-74 on a Jermaine Haynes Jr. layup. But unlike in their previous comeback wins where they got the clutch stops necessary to fuel a rally, the Hawks just couldn’t keep the Indians off the board for prolonged stretches. Trent Girard got a good look off a hard screen and found nothing but net. The 3-pointer led to the Hawks’ demise in more ways than one. Glens Falls drained 47 percent in the first half and O’Hara made just 1-of-12 as the Indians scored 18 of the game’s first 21 points en route to a 44-29 halftime lead. For the game, the Hawks made just 5 of 28 shots from 3-point range. Falling behind is something that became a recent trend for the Hawks, who trailed in each of their previous three games only to take flight and soar to victory. They fell behind again Sunday. However, the environment seemed to play a role in a dreadful start. For the game, O’Hara shot 39.2 percent from the floor but killed its comeback hopes by missing 12 of 28 free throws, with Hemphill missing five straight at one point. But, the Hawks started to attack the basket and suddenly pecked and clawed their way back – almost all the way. Instead they’re going to have to find comfort in setting the program record for wins in a season (26), winning a state Catholic championship for the first time since 1994 and creating a lifetime of memories in reaching the final game of the basketball season. 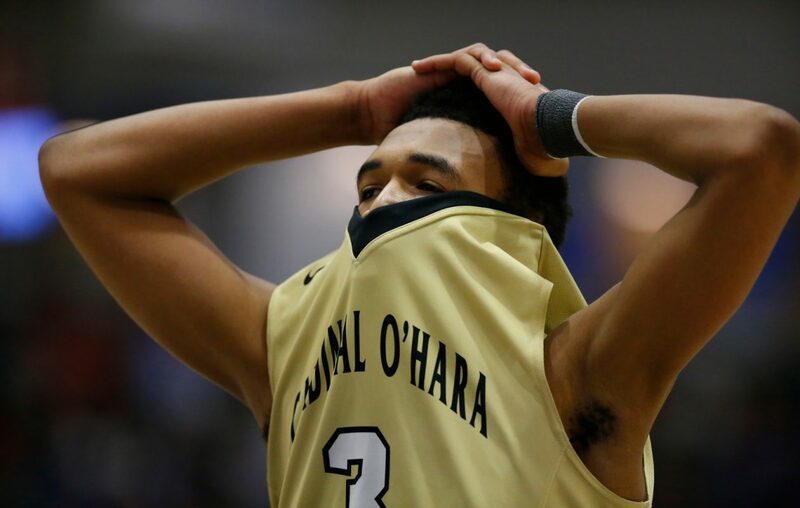 Haakim Siner added 20 points and Haynes 13 points and eight assists for O’Hara, which was trying to win its first Federation title since capturing Class C in 1994.